Reggie Wayne was one of the Hurricanes most consistant and reliable receivers in the program's history. A 2 time All State honoree out of John Ehret High School in New Orleans, he made an immediate impact on the Miami offense and showed the talent that would take him into the record books. 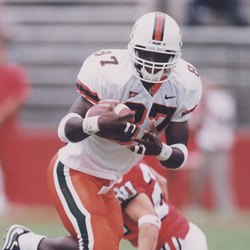 As a freshman in 1997, he was named BIG EAST Rookie of the Year and a Sporting News Freshman All American, and 2nd team All BIG EAST, when he led the Canes 640 yards receiving on 48 catches, the latter breaking Michael Irvin's freshman record of 46. In 1998, he again led Miami with 42 receptions, and was 2nd in receiving yards (629), though he missed 2 games with a torn ACL. In 1998, he caught 40 passes for 486 yards and 4 touchdowns. In Miami's 2000 season, the senior led the team with 755 yards receiving and a 17.6 yards per catch average on 43 receptions. His 10 touchdowns are tied for 2nd most all time behind Irvin's record of 11 in 1986. Reggie is the school career leader in total receptions with 173, a close second to Santana Moss in yards receiving (2,510) and is tied for 3rd in career touchdowns with 20. He holds the school record for consecutive games with a reception in 36 straight games. He was named the Miami Strength and Conditioning Athlete of the Year by the coaching staff in 2000. A first round pick (30th overall) by the Indianapolis Colts in the 2001 NFL draft, Reggie has played 10 seasons and amassed over 10,000 yards receiving and has caught passes for more than 1,000 yards in 7 straight seasons. A four time Pro Bowl selection, he helped the Colts to the victory in Super Bowl XLI at Dolphin Stadium in 2007. Reggie graduated Miami with a Bachelor of Liberal Arts (BLA '01) degree.